This suit is the most fantastic suit of all Time. I cannot recommend it highly enough. Mr. Magnoli is so much more than a fantastic tailor. His customer service is out of this world. I have never before felt so welcome to ask questions. And he responds lightning-fast (Record time is 7 minutes). I did have to get it tailored a bit to fit me better. But, that was because I made the measurements a bit big, just to be safe. I decided to put off the review until I'd worn the suit a few times to really get a feel for it. And my opinion of this suit has only grown. I like it even more now than I ever thought possible. I wear it whenever I get the chance. Even to school. Everywhere I go, I receive compliments. 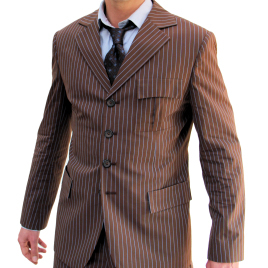 And not only is it a wonderful suit, it is an incredible reproduction of our beloved Doctor's suit. "Molto Bene" does not even begin to describe it. All in all, it is my single most treasured item, and I encourage you to get your own. You will not be disappointed.